Tuesday Burritos, Gardener’s Pie and an eReader! Well – I realised I haven’t done any recipes for a while, so tonight you get two (though, they’re both pretty simple) and some added extras. I’m not going to give you a recipe for burritos, because you don’t really need one. I’m just going to say that this is a Tuesday-night tradition that you should be getting on the bandwagon of. You can do so, so much with burritos but really, less is more! We use, as weekly staples, refried beans, tomato, lettuce, hot taco sauce. S has cheese, and sometimes has Fry’s chicken strips. I sometimes make a more extravagant spicy-bean-mix. Sometimes we have avocado. They are delicious and you should be eating them right away. Steam or boil your potatoes and mash how you like. Drain your lentils. Put your oven on to about 180 degrees. Dice up the carrots and celery so they’re about the same size as the peas. Combine, in a mixing bowl, the lentils, tomato, peas, carrots and celery. Mix well, and then scoop into a baking dish (or, into 6 individual ramekins). Slice up the left over cooked veges and place them, either neatly or haphazardly, over the top of the lentil mix. Sprinkle with nutritional yeast (this can be done between the lentil and vege layer if you like, or omitted all together). 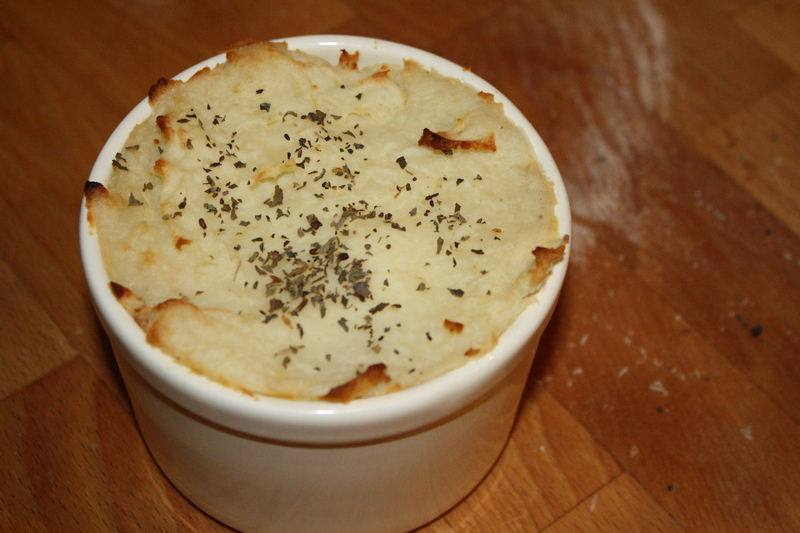 Spoon mash potato (or pumpkin or sweet potato) over the top of the dish and bake until hot though and the top if crusty. For something different – add some finely chopped spinach to your potato mash! Added Extras: Recipes I have been throwing around the ‘net. Throw it all into a food processor and blend until it looks right. Get a tin of pie-apples (or stew your own on a weekend and pop them in the freezer for apple-crumble emergencies!) and heat them up. Crumble is super easy – mix some wholemeal flour, some cinnamon, some psyllium husks (optional) and some brown sugar and then dump a lump of non-diary marg into the dry mix and smush it around with your fingers until the whole thing is lumpy – spread it over a baking dish and pop it in a hot oven for 10-15 minutes until it’s crunchy and lovely. Put hot crumble over hot apples and devour! After spending the last two and a half years telling S how much I really, really want an eReader I finally got one! Initially, I wanted the Kindle, but I ended up getting a Kobo. First of all – it’s just an eBook reader. You download books onto your computer, plug it in and hey presto, you have a (possible) thousand books in your hand. I didn’t want any extra faff (and I don’t really need to spend any more time on the Internet), just something I could read books on. The Kobo is really light, I could play around with one in the store and I like the eInk display. It looks like paper. There is debate about pretty much everything new than lands in our laps – and for eReader devices one of those contentious issues is about pollution. Is it more environmentally friendly to read a (real) book or to read eBooks on an eReader? There are a number of issues here including the energy/pollution/raw materials it takes to actually make the device and it’s battery. Undoubtedly, when you look at any eReader v. a single book, the eReader would hands down be detrimental to the planet. Then there is the obvious on-going carbon issue, as somehow you have to charge up your handy little reader and that consumes energy (and we all know that story). On the other side is, of course, the trees that are not produced into books, and the energy and raw material saved from not publishing, and – this is the kicker for me – the miles that books are not flown all around the globe, driven from ports to bookshops to be picked up by people in their cars. I hope that by the time I have children, who will inevitably attend school and – should they choose – university, things like this are pretty standard, and being used across ever faucet of life. I hated carrying mountains of very heavy textbooks back and forward from classes that I hated in a badly designed brown schoolbag – and I would never wish that dismal fate upon anyone else. Pre-heat oven to 200 degrees C, and ‘butter’ (or oil) a pie dish. When it’s rolled out, carefully place it into a well-‘buttered’ pie dish. Make sure that you really push the corners in well, and make the sides even, gently push a few fork-holes into the bottom of the pie. Push or cut off the excess and leave to the side (this will become the lid of the pie). Line the inside of the pie with baking paper and beans or rice (you can keep this rice for future blind-baking, but it’s probably best not to eat it…) and bake for 15-20 minutes, until the pie base is looking almost cooked. Finely chop up the leek and onion, and dice the carrots and potatoes, and chop up the broccoli florets (and stems, if you like them) into bite sized chunks. Saute the leek and onion, and boil the carrot, potato and broccoli in a separate pot, until they are almost cooked then set aside. If you have not just cooked your lentils, or if you’re using canned lentils, place them in a big pot to warm up, with a pinch of salt. Once they are warm, add a pinch of vegetable stock powder, gravy mix (if desired) and stir around until the lentil mix is totally warmed though. If it starts to look too dry, add a small amount of water – but be careful not to make it too soupy (otherwise the filling will just pour out when you cut into the pie). Add all the vegetables and combine together. Add salt, pepper, or more vegetable stock to taste. Fill the pie case with the mix, and let it rest down while you roll out the lid of the pie. Work the remaining pastry only until it is one uniform lump again, and roll out as above. Cover the pie with the lid, and press the sides around the rim of the pie case. Punch a few fork holes in the top, wipe over with some rice milk and bake until golden brown on top. I like to pull the pie out of the tin for the last two or three minutes of baking – but it is certainly not a requirement. 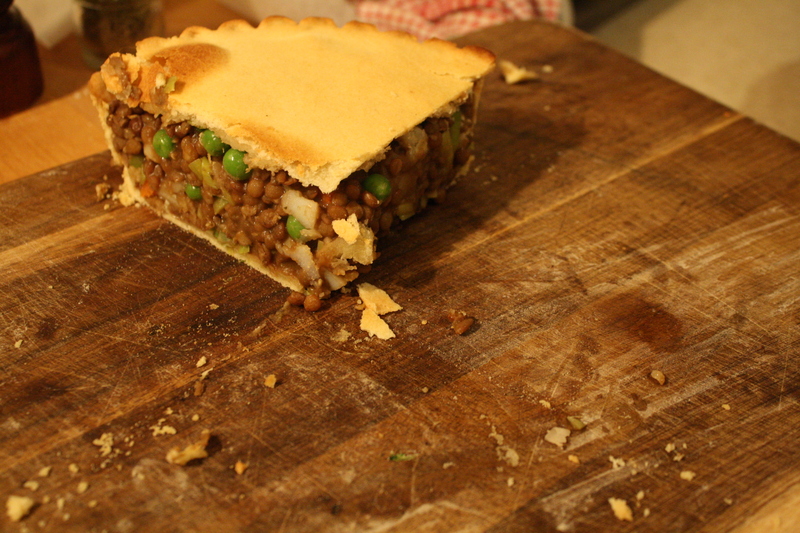 And, hey presto – a wonderful, warm, winter pie!